This mediterranean carrot salad is filled with chickpeas, royal raisins, feta, parsley and tossed with a creamy yogurt tahini dressing. Makes a great side salad for any cookout this summer! I bought my spiralizer last August (I hate that it actually took me that long to do it – so many missed spiralizing opportunities!) 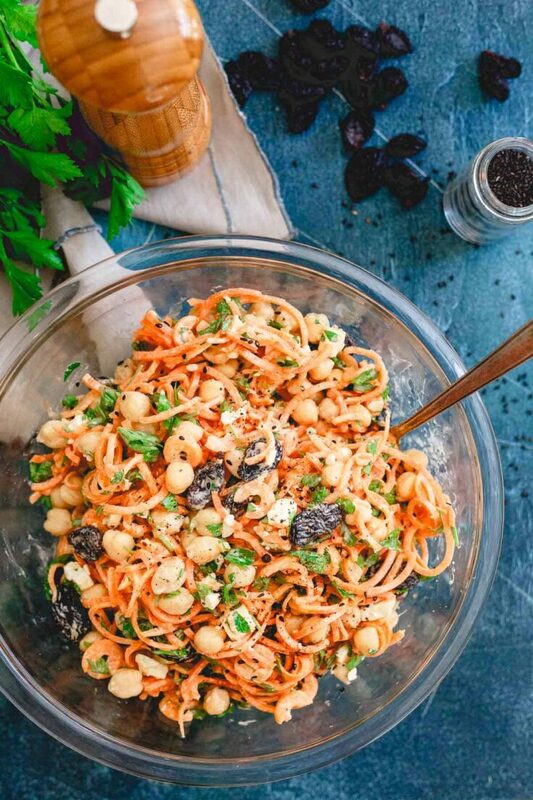 and somehow, even though it’s been almost a year, I never spiralized a carrot until this mediterranean carrot salad recipe. Now that it’s been done, I think zucchini and I are taking a short break (even though it’s almost prime time for zucchini pasta with avocado cream sauce and Chinese chicken zoodles) because I might just be obsessed with carrot noodles. 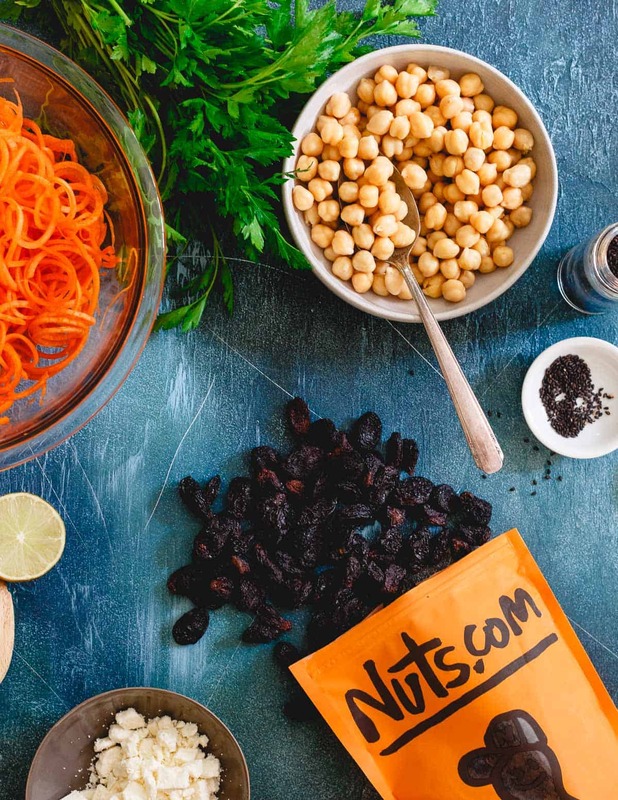 *This yogurt tahini mediterranean carrot salad recipe is sponsored by Nuts.com, a 2017 partner of Running to the Kitchen using their autumn royal raisins. All content and opinions are my own. 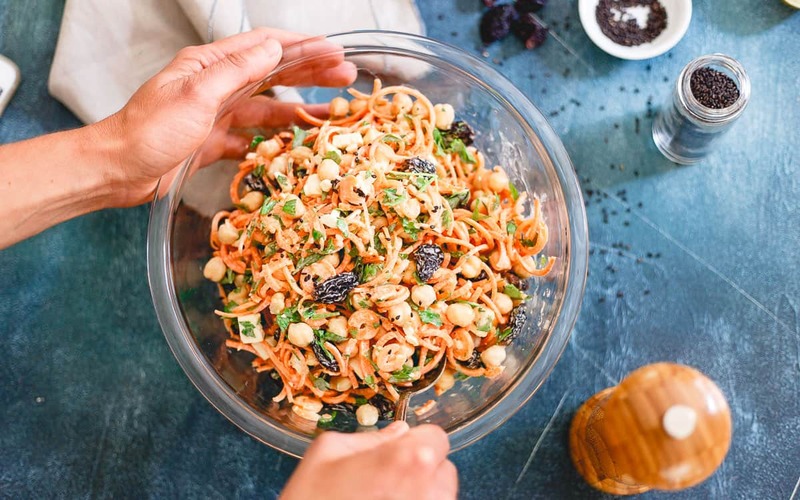 I’ve made carrot salad before and one of my favorite parts of that recipe were the sweet bites of dried cherries. Dinner salads growing up always had nuts and dried fruit in them in our house so I think it stems back to that for me. I feel like raisins are a polarizing fruit for most. People seem to be very opinionated on their place in baked goods and while some (me) have fond memories of those little red snack boxes, others seem to be disgusted at the thought. I’m a raisin lover though and when thinking about how to incorporate these autumn royal raisins from Nuts.com, a mediterranean flavor packed salad seemed perfect. These are no snack box raisin though. They’re about 3-4 times the size (and the largest variety of raisin out there! ), seriously plump (they almost remind me of a prune) and have an almost caramel-like taste to them. Getting one on your fork while eating this carrot salad feels like a special treat because you just know it’s going to be a good bite. Equally as delicious as the royal raisins is the creamy yogurt tahini dressing. I love tahini but I have a bone to pick about any and every brand I’ve ever bought because without fail, it ALWAYS separates and I’m left with upwards of an inch of oil at the top and the hard sesame paste at the bottom. Unlike nut butters, it’s impossible to stir and it always seriously pisses me off when I go to try and use it. Fortuitously, I read this post on how to make perfect hummus recently and she whipped the tahini first in a food processor. That little trick completely eradicated my annoyance at the separated tahini and resulted in the most luscious and creamy tahini yogurt dressing for this salad. With a touch of lime juice and honey, it’s really the most perfect mediterranean-like accompaniment to this carrot salad. Maybe that canister of tahini that usually sits in the back of my pantry will get a little more attention now thanks to that genius idea. 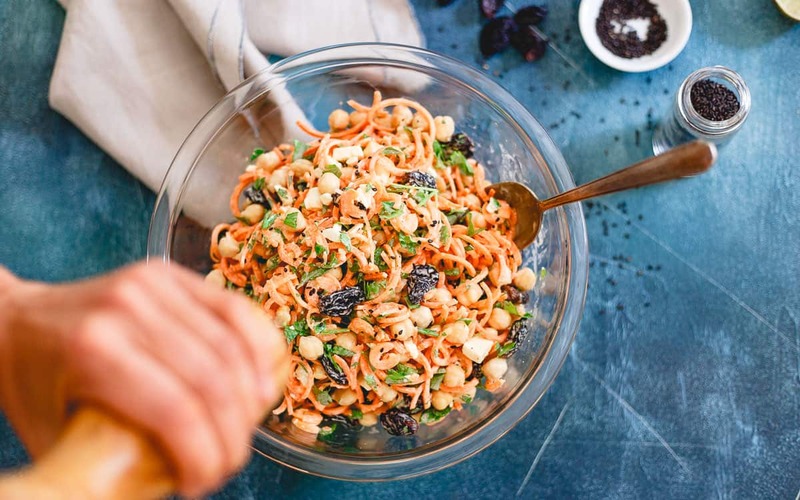 With a hearty carrot noodle base and chickpeas bulking it up, this is really more than just a vegetable side dish. It’s a salad that can double as both side and salad for any summer cookout. It literally goes well with almost anything off the grill and I’d venture to say, just a tad bit healthier (and more flavorful!) than any pasta or potato salad out there. This mediterranean carrot salad is filled with chickpeas, royal raisins, feta, parsley and tossed with a creamy yogurt tahini dressing. 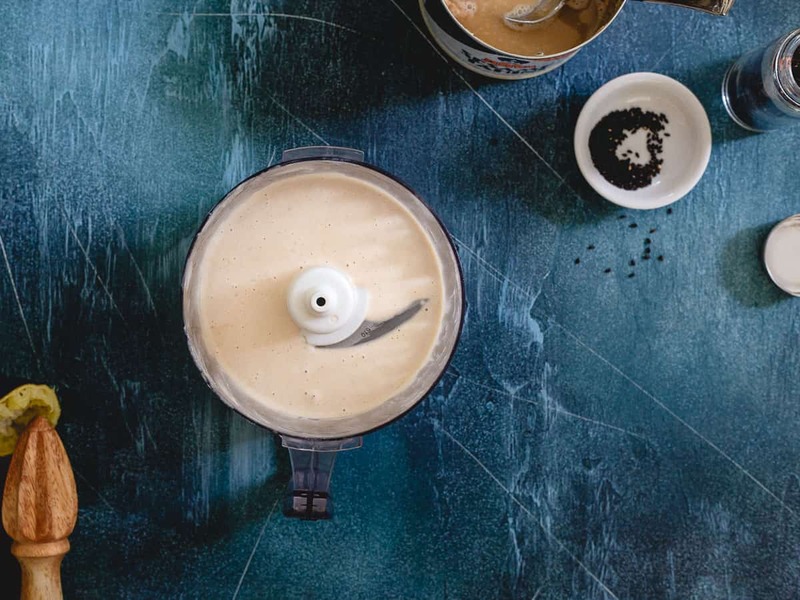 Place tahini and 2 tablespoons water in a food processor. Process until whipped and smooth. Add the yogurt, lime juice and honey and process again until smooth. Add additional water (1-2 more tablespoons) as necessary for desired consistency. *I used about 1 tablespoon. Using a spiralizer on blade D or a julienne peeler make noodles from the carrots and trim into manageable size for eating. Place the carrot noodles in a large bowl. Add the chickpeas, raisins, parsley and feta. Add the dressing and toss until well combined. Season with salt and pepper to taste. Garnish with black sesame seeds. Serve immediately or keep chilled until serving. Simply perfect :) LOVE the carrot noodles! Love the entire ingredient list Gina. And that dressing. So nice and healthy for summer! love this super flavorful and delicious carrot salad!!! 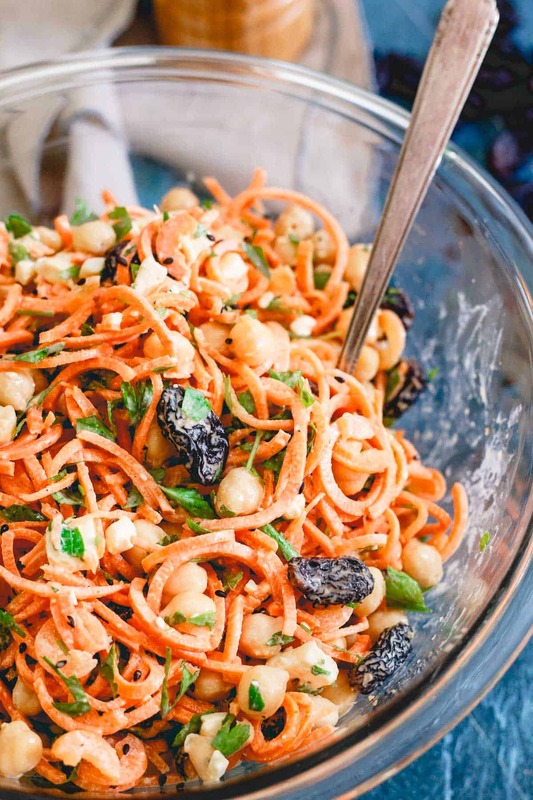 What a great spin on carrot salad! I love that I can use my spiralizer! I love the flavors you having going on in this salad! Ooooooo…what a super lovely salad! This would so be my kind of salad. Love these flavors! I just love this salad. It’s sheer perfection. Your tip for using the food processor is brilliant.